It’s late July in Los Angeles. Temps are on the rise. The dog days of summer aren’t quite here yet. But barking can be heard, approaching fast. The vinyl couch in your hot apartment is getting stickier and it’s true: something feels off. Probably because by this time last year, the LA Film Festival would’ve have already come and gone, leaving your indie film appetite fully entertained, edified and satiated for another 12 months. But the 2018 Festival hasn’t happened yet—and won’t, not until Opening Night on September 20 through September 28. So really, that vague anxiousness you may be feeling is just misplaced anticipation. Hopefully, then, today will be some small relief as we continue the slow-burn striptease easing us into full-fledged Festival season. Why? Because we’re debuting one key bit of anatomy you’ll soon be seeing everywhere: the piercing eyes and colorful starscape of artist Alia Penner’s official 2018 LA Film Festival poster—coming soon to a street pole banner near you! An L.A. native (Topanga Canyon, specifically), you may recognize Penner’s fresh spin on pop art collage from a variety of distinguished sources. She’s created sets at New York and London fashion weeks, animated short films for Diane von Furstenberg and Warby Parker; her commercial clients have included The ACE Hotel, The David Lynch Foundation, Tiffany & Co. and others. And if you’d like to purchase your very own copy of the post, that is something you can now do. Just visit our new festival store and check back regularly as we update with new LA Film Festival swag. Above all, Penner is a dyed-in-the-wool cineaste—chiefly, as the Creative Director (!) 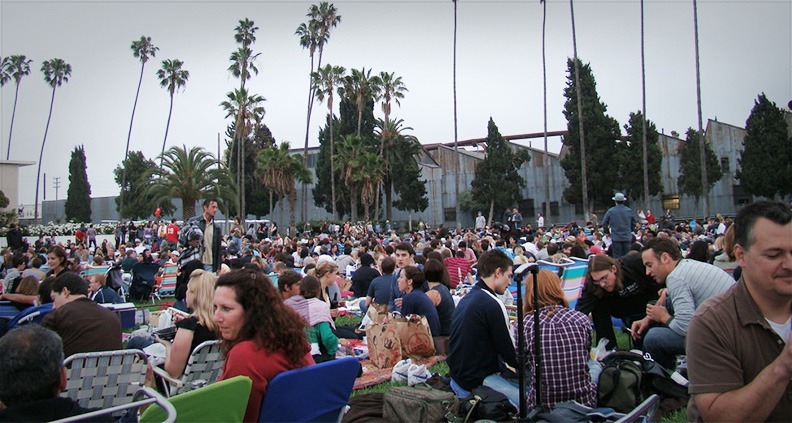 of Cinespia, the popular revival screening programmers most famous for turning the Hollywood Forever Cemetery into a retro-movie mecca. Does that implacable mien inspire you to action? Well, good news. If you’re a Film Independent Member, Festival passes are available for early purchase starting… right now. Click here for more information. We recently got a hold of Penner to discuss her newest gig creating the look of the 2018 LA Film Festival, her process, being a film programmer and much, much more. How did you become involved with designing the poster for the 2018 LA Film Festival? Penner: I became involved with the festival when Jennifer Cochis reached out to me. The first time we spoke she was in the middle of watching films at Cannes and we just got each other right away. It was like we had known each other for years. She’s very supportive of artists and really gives you the freedom to create. Tell me a little bit about the poster itself, what are we looking at here? Penner: When I heard that the poster would be made into billboards and buses around the city, I wanted to make something that would POP. I loved the idea of a giant pair of eyes looking up at the stars as you drive by. I wanted to make an image about what it feels like to be one of those wonderful people out there in the dark, watching the magic of movies come to life. You’re obviously a big film lover. Can you tell us a little bit about your work with Cinespia? Penner: I’m the Creative Director at Cinespia and have been working with them for almost 10 years. The founder, John Wyatt, and I work together curating the movies, music and our photo booths. Each Saturday our team builds a entire set inspired by the film for people to take photos in. It’s so much fun watch everyone dress up and bring their favorite characters to life. Its very rewarding to see 4,000 people laughing and cheering to a movie that we love, all together in our beautiful city. 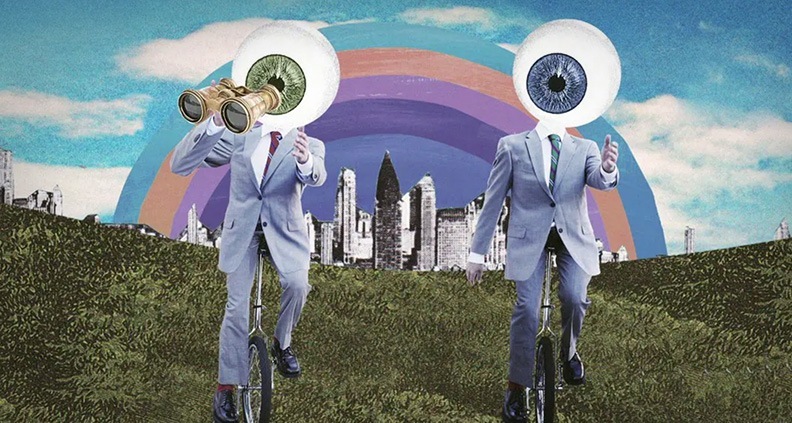 Who are some of your own favorite artists or graphic designers? Penner: Saul Bass, Niki De Saint Phalle, Tony Duquette, Sonia Delaunay, Yves Saint Laurent and Yayoi Kusama. What pop culture outside of the art world inspires you, visually? Penner: Living in LA, you’re always in your car. I love podcasts and audiobooks that take place in our city that transport you to another time. Some of my favorites are Eve’s Hollywood by Eve Babitz, Easy Riders, Raging Bulls by Peter Biskind and right now i’m listening to By Myself & Then Some, read by Lauren Bacall. I’m looking forward to the new season of You Must Remember this by Karina Longworth, about Kenneth Anger’s Hollywood Babylon. What’s the coolest film-related visual you’ve seen in the past 12 months? Be it a poster, title sequence, individual shot, DVD box art, etc.? Penner: I went to Las Vegas this year and was introduced to an incredible man named Grant Philipo, who has the largest collection of Showgirl costumes. His house is a shrine filled with the most gorgeous and wild clothes I have ever seen. It was so inspiring to see the history of this dazzling lost art all in one place. He also had wax figures of Hedy Lamarr and Marlene Dietrich! You’re from LA. How would you describe what’s special or weird about LA to a non-Angelino? Penner: I love Hollywood history and hope that we treasure what we have left of it as our city grows and more people move here. When I go out to dinner at Musso & Franks or Lucy’s El Adobe or explore the epic movie palaces in downtown. It feels so important to preserve and celebrate the historical landmarks our city has to offer. Festival passes are on sale to Film Independent Members beginning today, July 24, at 10:00 am PT. Not a Member of Film Independent yet? Click here to learn about exclusive Member perks and savings at the Festival and join today. Festival passes go on sale to the general public on July 31, when the unveiling of the Festival’s Competition Program. 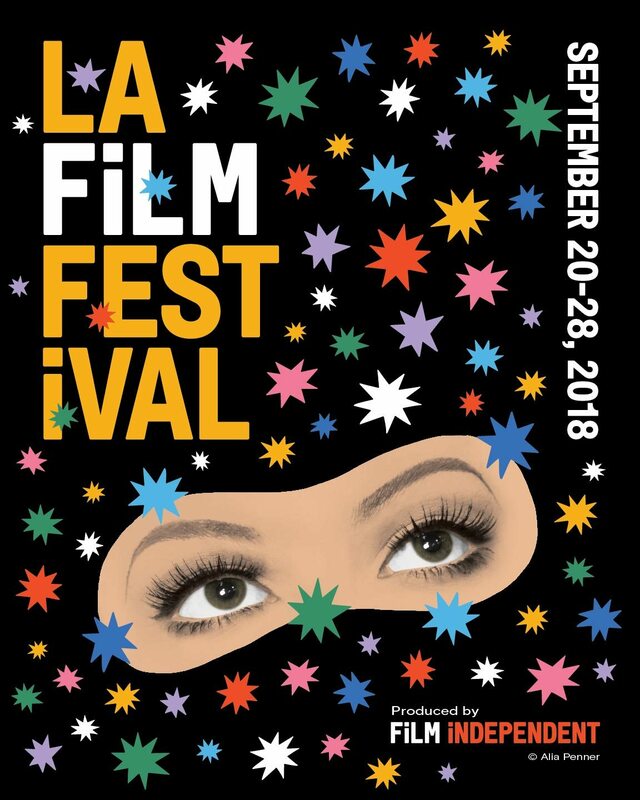 The 2018 LA Film Festival takes place September 20-28. Venues include the ArcLight Cinemas in Culver City, Hollywood and Santa Monica, as well as the new Loyola Marymount Playa Vista campus, the Wallis Annenberg Center for the Performing Arts and the Writers Guild Theater in Los Angeles. Presenting Media Sponsor is Los Angeles Times. Official Host Venue is ArcLight Cinemas. Platinum Sponsors are American Airlines, EFILM | Deluxe and HBO. The University Sponsor is Loyola Marymount University School of Film and Television. Festival Supporters are Directors Guild of America, eTech Rentals, Kona Productions, TREETI and Visit Seattle. Festival Affiliates are 21st Century Fox Global Inclusion, ATK Audiotek, SAGindie and Writers Guild of America West. Additional support provided by National Endowment for the Arts. Stella Artois is the Official Beer. IMDbPro is the Official Industry Resource. CITI is the Official Credit Card. The LINE, NoMad Los Angeles and Freehand LA are the Official Hotel Partner. Essentia Water is the Official Water. Getty Images is the Official Photographer.